To preserve scarce affordable housing units, and reduce the displacement of vulnerable tenants and homeowners, a number of things can be done at the local, state, and federal scale. Many of the following policies overlap with production and protection pages. E.g. 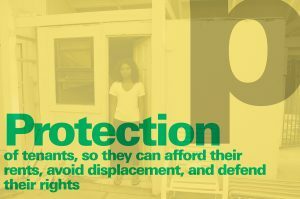 housing trust funds can be used for both building and preserving affordable housing, while vacancy controls, eviction protections, and emergency rental support is also a means of preserving affordable rental housing stock for future tenants. Other policies, those to do with SRO preservation, condo conversion controls, and VRBO regulations are only discussed on this page. HUD has been developing a number of preservation policies and programs, available on its Preserving Multifamily Properties page. Primary among these is the newly created Office of Affordable Housing Preservation (OAHP) dedicated to preserving FHA-insured properties with maturing mortgages, and “Mark to Market,” which aims to reduce rents to market levels by restructuring existing debt to levels supportable by these rents. The Green Initiative is also available through this program to assist owners in rehabilitating their properties in the most sustainable way feasible. Additional tools exist for housing to low-income elderly residents via the Senior Preservation Rental Assistance Contracts (SPRAC), and for renewing Section 8 Housing Assistance Payment (HAP) contracts, as well as supporting Section 8 tenants who may be displaced. See: Tenants Rights Network information. The lead agency focused on affordable housing preservation in the state is the California Housing Partnership Corporation [CHPC]. Read the full CHPC report, “2014 Statewide At-Risk Summary.” CHPC works in several ways to try to ensure that these homes remain affordable to low-income Californians. CHPC’s Preservation Clearinghouse is the state’s most comprehensive source of information on subsidized affordable housing at risk of losing its affordable status and converting to market-rate housing. This constitutes the only comprehensive database of all HUD subsidized properties, USDA Section 515 rural properties, and properties financed with Low Income Housing Tax Credits in California. CHPC uses the database to identify affordable properties that are at risk and should be targeted for preservation. Also see their Local Preservation Strategies for recommended best practices. And their Preservation Program, an advocacy program seeking to “build a voice for California’s affordable housing industry in state and national policy debates.” CHPC is an active member of the National Preservation Working Group, which has developed a federal policy platform of new strategies and solutions to preserve affordable housing. Newsletter. 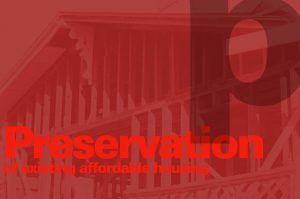 CHPC publishes the monthly e-newsletter Housing Preservation News, which provides information to readers on preservation policy, legislation and strategies as well as case studies of preservation properties. In the Santa Cruz County Housing Element for 2015, authored by the Santa Cruz County Planning Department, Preservation is Goal #4. As stated, “the County strives to be able to provide resources to members of the community seeking affordable housing opportunities” including by “retaining affordability protections for single units and housing complexes, and encumbering market rate units with long-term affordability covenants using the Density Bonus Program and other available tools.” A leading policy implemented by the county is to “preserve the continued availability of the affordable housing stock located in the County’s manufactured home parks.” Twelve additional programs exist to meet this goal, including a Condominium Conversion Ordinance, Vacation Rental Ordinance, and programs to preserve housing with expiring restrictions, including Measure J units and HUD-assisted affordable housing units. We discuss a few of these below. Housing Trust Funds (HTFs) are also discussed on the Production page. HTFs complement existing federal, state and local efforts to both increase and preserve the supply of decent, safe, and sanitary affordable housing for extremely low-, very low-, and moderate income households, including homeless families. Typically, they do this by dedicating a percentage of their funds towards maintenance and rehabilitation of affordable housing. The conversion of multifamily rental housing to condominiums may result in a decrease in the supply of units affordable to low-income renter households. For this reason, many cities in California and across the country have implemented a range of controls on such conversions. All of these approaches are designed to preserve existing rental housing at more affordable prices, until long-term solutions can be found. Historically, the most dramatic increases in conversions have occurred just before peaks in the real estate market, such as between in the late 1970s and 80s, and again between 2002-2004. Beginning with the wave of conversions in the late 1970s, California cities like Berkeley and Santa Monica have been at the forefront in adopting condominium-conversion and demolition controls, as well as additional limitations on the conversion of hotel rooms and apartments to other uses. Demolition of rental housing in favor of nonresidential construction prompted Berkeley and Santa Monica to adopt the first demolition controls in the US, while in 1979 San Francisco became the first US city to regulate the conversion of single-room occupancy (SRO) residential hotels to preserve them as affordable housing. [i] Santa Cruz adopted similar ordinances, and also regulate the conversion of apartments into commercial uses in certain districts. While such policies are widespread, Urban Displacement Report’s Policy Brief: Condominium Conversion in the Bay Area finds that such controls are not as effective as they could be because of loopholes in the laws, or not as necessary as they used to be because fewer conversions are happening now. In the coming decades, increasing life expectancy, a declining birth rate, and the aging of the baby boom generation will dramatically increase the number and proportion of the U.S. population over the age of 65. For an interactive map of the aging of the U.S. population between 1990-2010, go here. With 32.5% of the population in Santa Cruz County over 50, and expected to rise further, and 40% of all older Santa Cruzans (age 65+) lacking income to meet their basic needs, the question of how to house our aging population is a pressing one. Yet just as demand is increasing, percapita spending on senior support programs has declined to levels of the 1984. One of the most impactful interventions is to support what most seniors say they prefer: “aging in place.” This enables seniors on fixed incomes to stay in their current home or move to affordable, age-appropriate housing within their community, rather than being displaced to a nursing home which many can’t afford or don’t need, or becoming homeless. To make these options viable, we must adapt homes and communities to meet the changing needs of aging residents, provide suitable affordable housing options, and connect seniors to services. Advocates, including our own Seniors Council of Santa Cruz and San Benito Counties call for a combination of public policies and public private initiatives to make this a reality. 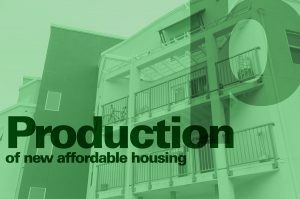 As discussed in the Production section, a significant part of the market’s failure to provide housing affordable to low income renters stems from government regulations that govern the size, quality, and density of housing that can be built. For instance, minimum size requirements and mandatory large lot zoning can simply price new housing out of reach of low income families. On the other hand, zoning and land-use strategies that enable cities and counties to build multifamily affordable housing, and to maintain that housing in perpetuity, are essential preservation tools.